All of Gao Shun's escapes are treated as attacks. When Gao Shun is damaged, he can duel the source of the damage. There is no drawing reward for killing Gao Shun. "Bravery" is not a choice, so Gao Shun cannot avoid an attack unless he has the Eight Trigrams. 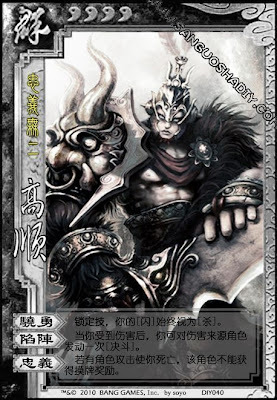 When Gao Shun is damaged, the duel that follows cannot be negated. During this duel, he can use all of his Escapes to fight the other player. If Gao Shun is killed as a rebel, the kills draws nothing. If the king kills Gao Shun as the loyalist, the king still loses everything.